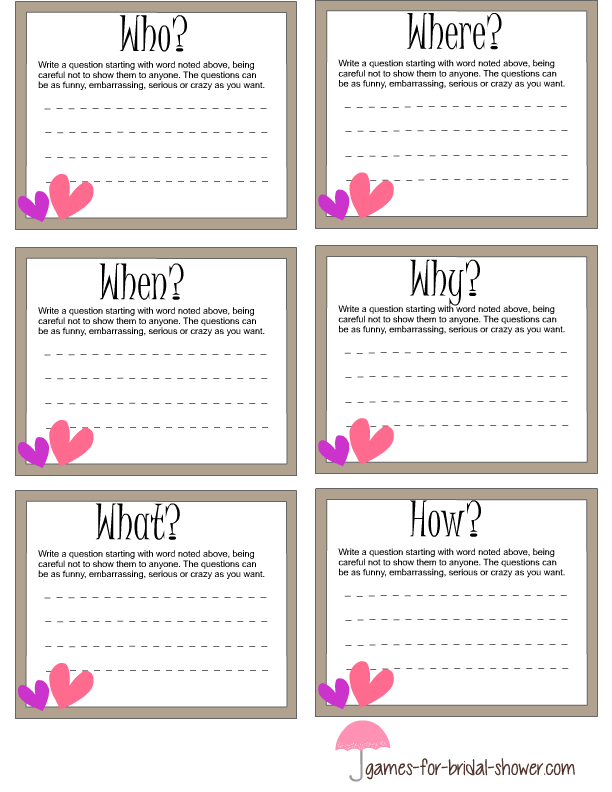 This is a little different version of the famous 'Truth or Dare' game and you will enjoy it a lot if Bridal Shower is for a close circle of friends.This is one of my most recommended games that I have made on my site. I have made this game in three different colors so you can pick and print the color that suits your party more. 1 or 2 days befor Bridal Shower Party, print this game according to the number of your bridal shower party guests. There are six different game cards on 1 page so you can count and print accordingly. You can print this game on card stock or even on ordinary printing paper. How to Play: Distribute one game card to each guest along with a pen or pencil. There is a different word written on each game card. Ask your guest to write a funny, silly, crazy or serious question that starts from the word given on the card. They have to be careful as there is a chance that they will end up answering that question. After all guests have finished writing the questions, collect the cards back from them and shuffle them and then ask the guests to pick a card one by one and answer the question that is written on it. I am sure that everyone will enjoy this game. These are free printable game cards with a brown border. I recommend that you print these on card stock so you can distribute and shuffle these easily. To save the printable version, click on the image shared above and then right click and save the bigger printable version. Cute each card around the edges so you can give one card to each of the guests. 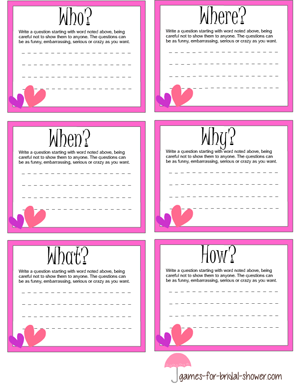 These are game cards in pink color for this version of truth and dare game. You can print these cards if pink color matches your bridal shower party theme more. Two cute pink hearts give each of the game cards a unique look. If bride likes Lilac color more and you are having a lilac color bridal shower party theme then print these game cards. These cards are adorable and this game is fun for sure.